Hi! 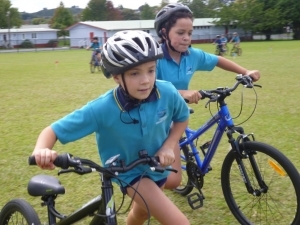 Lately Mavis, Nigel and Joan have come to Onerahi Primary with their big truck full of equipment like bikes, helmets, tape, and flags help the students train for the exciting Tri-kids triathlon. Mostly all of the kids were excited and happy. They taught the children good ways to hop on and off their bikes to get ready for the triathlon. They learnt to hop off their bike before the black and yellow tape, otherwise the were down on the ground for five proper press-ups. Mavis, Nigel and Joan told them to bike on the inside of the blue flags and run around the red flags. Then it was Friday the day of the Tri-kids. All the students were excited. The year zero’s and the year one’s did their triathlon in block one, the year twos and threes did their triathlon in block two and the year fours, fives and sixes did their triathlon in block three. When Mavis was about to start the triathlons, Nigel sprayed the students with the hose. The girls and the boys started screaming and squealing in excitement. Then the horn blew. Students yelled and cheered their friends on. The kids sprinted into the water with huge grins on their faces. Off they went sliding on the 2 or 3 meter water slide all the way to the grass and then they started sprinting to the bikes. ‘Click‘ went the clicks on their helmets, and after that they quickly lowered or made their seats higher, so that their bikes were nearly perfect. Then they rode their bikes as fast as they could, on the inside of the blue flags, as many times as they had to. When they got back to transition they quickly took off their helmets, shoved their bikes in the bike rack and started on their run. Mostly everybody started jogging at the start of the run, and when they started to get the right pace that they knew was comfortable for them, they kept that pace. When the students finished their awesome Tri-kids triathlon, they held up their hands in delight and gasped to catch their breath back. Then they yelled out a big ‘ THANK YOU ‘ to Mavis, Nigel and Joan. Then they left the field feeling very proud of themselves. What were the names of the people who came to Onerahi School? What was on the truck? What skills did the students learn? How do you think the students felt after they had finish? Draw a timeline of the events in order.